William "Bill" Kristol, speaks to students about the bright side of our current political climate. 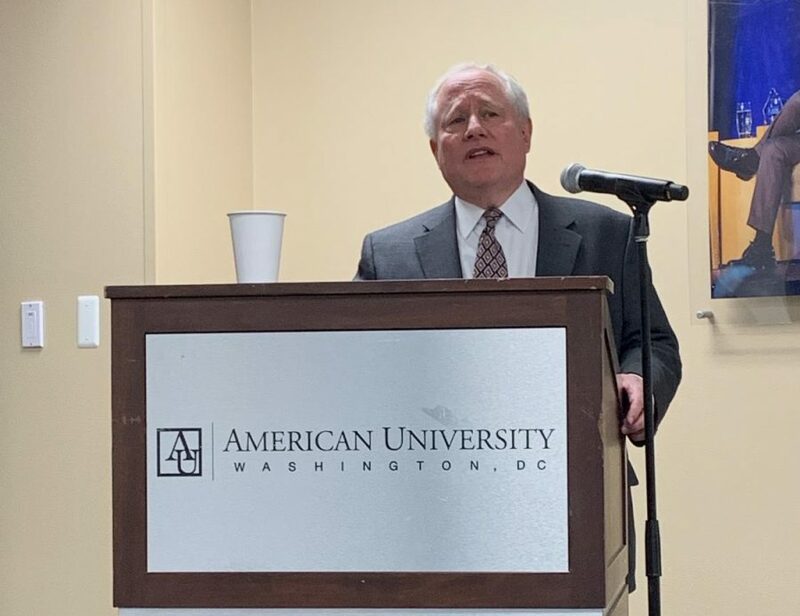 Kicking off his semester fellowship at AU’s Sine Institute of Policy and Politics, conservative political analyst William “Bill” Kristol spoke to a crowd of over 90 students and faculty members in Butler Board Room last Thursday evening. The Political Theory Institute hosted the talk, titled “The Future of Conservatism and the Republican Party,” which focused on the present political atmosphere and its historical context. The message of optimism resonated with audience members. Kristol compared the current political climate to the 1960’s and 70’s, two decades he described as volatile. Although these decades were notable for political discontent, they also gave birth to important reforms, such as the Civil Rights Movement. Kristol also pointed out that Trump’s most “impetuous” notions continue to meet resistance from civil society and constitutional checks at every turn. He cited several examples, including the courts’ rejection of Trump’s proposed “Muslim ban” and pushback from universities in support of DACA recipients. Regardless, Kristol, an outspoken leader of the conservative resistance to Trump, did not attempt to disguise his distaste for the president. In his lifetime, Kristol has held positions in both the Ronald Reagan and George H. W. Bush administrations, appeared as a regular panelist on Fox News, and founded the now-defunct conservative political magazine The Weekly Standard. Still, he pulled no punches in regards to his party. “The last two years have been a bit depressing for someone like me because the degree to which the elected officials have signed onto Trump is pretty astonishing,” he said. Kristol said he firmly believes the GOP has done “a lot of good for the country” in the past, but he remains unsure about how, or even if, the Republican party can be “salvaged” after its adoption of Trump-style politics. Kristol said he “could respect” someone who understood problems with Trump’s behavior but decided other items on the agenda – like Supreme Court seats or economic policy – were more important. What worries Kristol, in particular, is the “rationalization” of nativist tendencies. While Kristol did not shy away from making his point, his tone remained consistently mild, making the occasional light joke and keeping his remarks deliberately even-handed. He seemed to recognize the broad political spectrum represented in the audience. “I was expecting a very opinionated person, and I think what I found was that he’s a very reasonable and rational person,” freshman Marissa Klass said. Last semester campus appearances by two high-profile conservative speakers, Amber Athey, and Dinesh D’Souza, sparked protest and backlash from students. Kristol’s anti-Trump position and more centrist viewpoint made him less vulnerable to pushback from the student body. “I think someone like Bill Kristol represents more traditional conservatism, whereas someone like Dinesh D’Souza represents a newer brand of conservatism in the era of President Trump,” Flores said. As part of his Sine Fellowship, Kristol will lead small-group seminars about the Federalist Papers on Wednesday evenings, starting Feb. 6. He will also hold office hours from 3 p.m. to 4 p.m. on Wednesdays in Kerwin 311.